Robert B, Munchen Bier and Peas: Robinson, Mummy White and Latvian Pea. Goodlife, Welsh onion (Allium fistulosum), Lettuce Soulie and Spotted Cos, Gherkin Vjaznikovsky 37, Pepper Macedonian Sweet, Tomato Cuban Black, Squash Blue Banana, Broad bean Hangdown, Peas Mr. Big and Thomas Laxton, French Marigold. Markfield Rover, Climbing French bean Bird’s Egg, Tomato; Stump of the World, Homosa, Tibet Appel, Bijskij-Zeltyi, Herb Sweet Cicely. Jayb, Tomato Green Zebra, Choy Sum Red Stem – Brassica rapa – chinensis, Ethiopian Kale/Highland Kale – Brassica carinata, Glass Gem Corn, Bay Tree (Laurus nobilis), French bean Suess Becker (dwarf), Monstrance (climbing), cucumber Dib Daub. Ruud, Mustard, Georgia Collard, Stiense Runner Bean, Peppadew chilli, Climbing French bean Madeira Maroon and Blauhilde. Nigel B, Cardoon (Cynara cardunculus), Fruit Gogi Berry, Butter nut squash. SueK, Tomato; Yabloki Na Snegu and Sibirskiy Skorospelyi. Ian Pearson, Biskopens graaert pea, Cheltenham Greentop Beetroot, Painted Mountain Corn, Salsify, White Gem x parsnip. Pumpkinlover, French Beans; Brighstone dwarf, Purple Tepee dwarf, District Nurse climbing. Black Sugar Sweet Turnip. Welsh onion (Allium fistulosum) – In case you haven’t already have some growing on your plot…I added some seeds as they were flowering so well last summer and produced ‘tons’ of seeds that were shame to waste…you don’t have no excuses not grow any. They are not thuggish plants but produce plenty of ‘onion greens’ for cooking or to use as strong alternative for chives. Like with any onions…bees love the flowers…! Hangdown – An Old variety from 1800’s. Producing 120cm tall (or taller), very strong growing plants that bear good quantity of large 18-20cm long pods that hand downwards. Pods contain BIG, green and sweet beans that I have found being only slightly bitter, if at all. 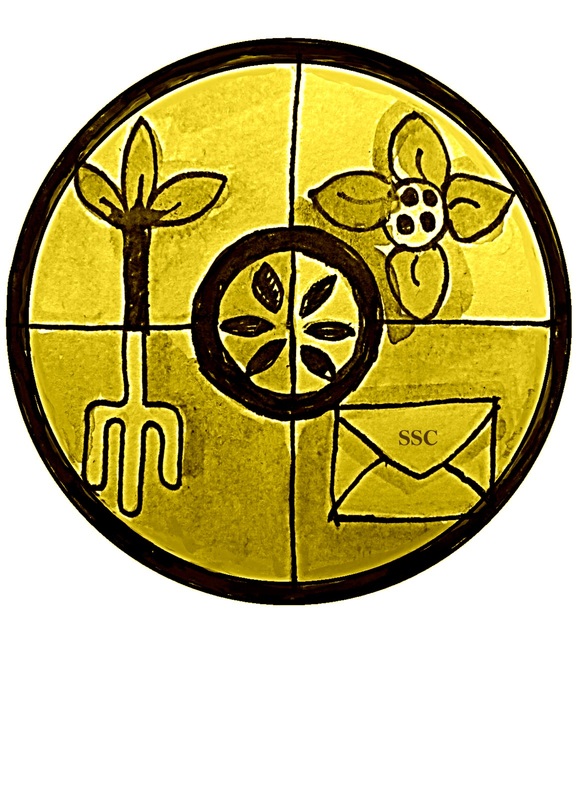 Mr Yeoman’s White Seeded Cherokee Trail of Tears – John Yeoman (author of books such as ‘Self Reliance: A Recipe for the New Millenium’ and ‘Gardening Secrets that Time Forgot’) had a seed conservancy called the ‘Village Guild’ which unfortunately does not exist anymore. The rare seeds he safeguarded and shared amongst Guild members, are however now in the HSL collection and offered in the HSL catalogue. One of the beans in John’s garden was the heavy bearing ‘Cherokee Trail of Tears’ bean. About 15 years ago, one of the pods on one of his plants produced white seeds. Growing these seeds on proved that a mutation had taken place, not a cross. 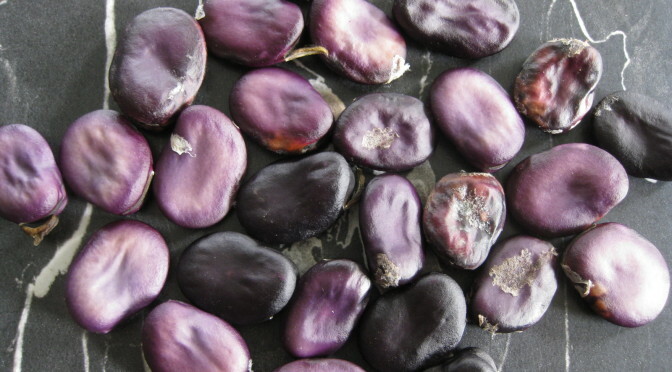 The beans are identical to the normal Trail of Tears beans, except for the colour: cream white flowers, white seeds and the green pods take longer to develop the deep purple hue when they are mature. This strain produces only white seeds every year and all generations of this strain grown since I had the seeds, have been stable. Same superb flavour, strong string and pod shape as ordinary Trail of Tears beans. The beans can be used for pods or for shelling and drying. Pods develop later in summer when early beans are past their first flush. I love harvesting them very young and small (no string then) and serve them cooked whole with a dab of butter. 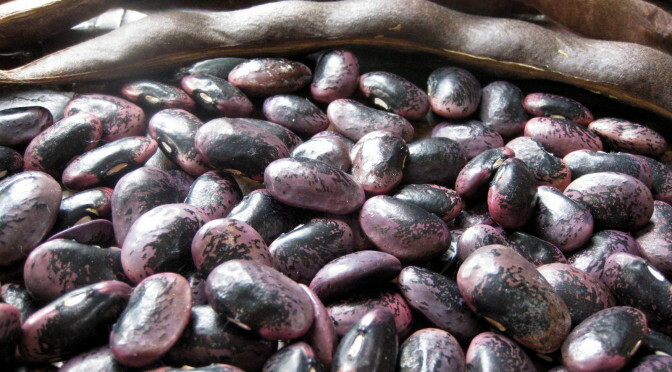 Black Valentine – This bean hails from the USA. I got my initial packet from a seed saving friend, who bought her seeds from Seed Saver’s Exchange (the US HSL equivalent). It is a very old heirloom bean, introduced by the famous Peter Henderson seed company in 1897. The nearly straight pencil shaped pods are up to 8 inches long. There are lots of them too. Normally when you allow pods to mature and dry for seeds, the plant stops making more pods, but in this case, we got a little harvest from the same plants I saved seeds from! They just kept going. This variety is best for its tasty green pods, but the black seeds are useful too at the end of the season. Purple Tepee – Seeds originally from Dobies I like this variety because it is easy to germinate and reliable. Lovely black pods which go dark green when cooked. Cheltenham Greentop – Roots are parsnip-shaped, sweet and nicely flavoured. ‘Greentop’ refers to the edible leaves, which are an acceptable substitute for chard or perpetual spinach. I find it is quite drought-tolerant probably because of its long taproot. “…scarcely any other is grown in the market gardens around Cheltenham” (Gardeners Chronicle 1889) No photo, but Stephen Nottingham has posted shots here. Choy Sum Red Stem – Brassica rapa – chinensis. Ethiopian Kale/Highland Kale – Brassica carinata. Corn ‘Painted Mountain’ – Cold-hardy multi-coloured corn. I’ve posted about it here. Info about its breeding here. Seed will germinate in cool conditions. Tolerant of high winds and bad weather. Grew to about 5ft for me, but quite variable. Seed originally from this swap group from a couple of years ago. Dib Daub – An Asian type cucumber, the fruits are green when growing, some mottling of the skin, which eventually ripens to yellow. These grew well for me in a poly-tunnel, the one pictured looks a bit short, I think as the picture was taken quite late on in the season and they should usually grow longer although they are quite stout. Interesting the little spines, which are easy to brush off, are black. Melothria Scabra, aka Mouse Melon or Mexican Sour Gherkins – I grow these in the corner of the greenhouse. A type of vegetable that produces fairly late in the season. Refreshing, crunchy, faintly sour tasting, ‘cucumberish’, barely inch-long fruits are good in salads or for snacking. They keep for a couple of weeks in the fridge and are also nice for pickling. The ratio of fruit compared to foliage or growing space needed, is excellent. If you believe James Wong, who calls these ‘cucamelons’, they also thrive outside in Britain and produce all summer long. This is different from my experience, but to be fair, I have never grown them outside. Nevertheless, they are definitely worth bothering with as an interesting ‘minor’ crop and they produce reliably (once past the ‘being eaten by slugs’ stage!). Useful too, because they come into their own when outdoor cucumbers stop producing in autumn. Their vines are very slender and grab on to anything, but they don’t swamp other greenhouse plants. Very mature fruits drop off the plants and I have taken seeds from those. Goji Berry – People say they can never get fruit, or much of it, from their Goji Berry. The one pictured was given to me by Steve, our friend of last year’s ‘Eat Me’ Mange Tout fame. As you can see, this one fruits abundantly, and hopefully the seeds will produce good plants too. I included plenty, so those of a mind to can sow many and select just the best fruiting ones to keep or pass on. Good luck in the lottery of seed genes! Soulie – I got the seeds from HSL..though available also from across ‘pond’.. Description borrowed from Adaptive seeds .. “Lactuca sativa. Rosy Green. 30 days baby; 55 full.Beautiful buttery cos type with dark-green, rounded leaves that form a nice rosette. Slow to bolt, the heads eventually get large and vase shaped with a nice rosy tint to the leaves. An English heirloom, given to The Seed Ambassadors Project by the Heritage Seed Library in England.”http://www.adaptiveseeds.com/product/lettuce-soulie I found this variety being very slow bolting…particularly slow when one wanted them to bolt….I grew plants indoors and outdoors and neither were in hurry to produce flower stems. Heh why to grow just green when you can have spotty! White Gem cross – Mother is White Gem, mongrelled with Avon Resistor. Field Pea – ‘Biskopens graaert’ Obtained from Soren Holt in Denmark, originally from Swedish seed savers exchange. Soren says: “one of the rare solid purple seeded pea varieties. It is a ‘greypea’, the original old fashioned fieldpea being a staple food in northern Europe in very old times.” These are high dry matter, less sweet than normal garden peas, suitable for making into high protein flour, adding to soup or stews, or making humus or ‘mushy peas’. I’ve grown them for three years in UK conditions, and found them to be about 6’ tall, and quite serviceable as mangetout or shelling pea, as well as for drying. Attractive picked as small pods and sliced diagonally in salads, showing off the baby red/pink peas within. My notes from 2011 say “sown 14/3, first pods 21/6, full cropping commenced 3/7”. Warning: mice can get a taste for these, and will climb the plants in broad daylight for them. Latvian Pea – About five feet. Purple flowers and speckled seeds. Good soup pea. Mr. BIG – Nice sweet peas growing from 3ft plant..and the talking point is its HUGE pods that never fail to impress with the size. Don’t be tempted to pick the pods too early as they tend to plump up well before the peas. Norli – I got my first packet of seeds from Samen Mauser in Switzerland, where mangetouts are very popular. A low growing variety that does benefit from pea sticks, especially in a windy location. The pods develop very early, but crop for a long time. Dark green mangetout pea with good, sweet flavour. Freezes well too, but best steamed after freezing. Robinson – Tall growing, productive, with long pods full of wrinkled peas. Swallow – This is the pea which was a in a freebie give-away seed packet from Bird’s Eye a few years ago. It is a very modern pea variety. Very sweet peas for shelling and lots of pods. Low growing, but does benefit from a few pea sticks. 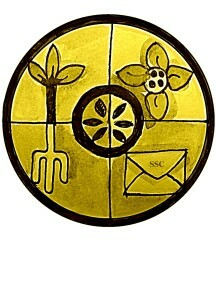 A few people have been asking whether anybody still had seeds, so I thought I might add these to our circle. In my garden they grew nearly 4ft tall and produced good crop of peas, sadly I didn’t get to eat many as the weather turned too dry and warm for them (being planted on ‘hot spot’) so instead of eating, I had plenty of seeds. Macedonian Sweet – My favourite pepper that is very reliable cropper, producing peppers that are good for eating raw, cooking or drying and grinding to ‘paprika’ spice. Due to how pepper and chilli crops were grown in ‘old’ Macedonia..there is little ‘historical cross breeding’ going on with this variety as well as others from the region…resulting odd fruit having little spicy heat. I have grown this variety for some years now and every ’round’ there seem to be less and less ‘heated ones’. Last summer’s crop didn’t produce single one, sadly as I find those fruit that little bit more interesting. Heat or no heat, they sweet and NICE! Salsify – I’ve saved these for about a decade. They started out as ‘Mammoth Sandwich Island’. Can be invasive by seeding, easily prevented by harvesting the flower buds (and eating them)! Blue Banana – As the name suggest, these are blue banana-type squashes that are produced on trailing vines, give them plenty of room for when planting!!! Lovely sweet, but not overly so, fruit that are just perfect for roasting or stuffing with savoury filling, perhaps a bit too large ‘for two’ to eat in one sitting. Striped Custard Marrow (cucurbita pepo) – Custard marrows, also known as Pattypan squash, are ancient. One of the very first vegetables brought back from the New World and described and depicted in the 16th century by the botanist Matthias de l’Obel, botanist and physician to King James I. They have also been called ‘simnel’ or ‘cymnal’ squash (as they resemble Simnel cake). My original seed source is Thomas Etty (who don’t stock these at the moment). Striped custard marrow produces a yummy cream/white, tulip-shaped, summer squash. If harvested early, the large bush plants produce many fruits. On maturity, the green stripes appear. Custard marrows can be eaten at any stage and now (early December) I still have some in store. Their light yellow, dense, sweet flesh makes them suitable as an ‘autumn’ squash too, similar to acorn squashes. No peeling needed. Rat Tailed Radish – Grows to about five feet, and needs staking as it flops everywhere. I saved seed from some of the plants which stayed upright longest, but I don’t know whether that’ll make any difference at all. Lots of small pods; pick them as soon as they stop swelling up. They’re good in soup or stir fry, with a peppery taste. A lot of the roots are still alive, and I’ll be growing some on to see what happens this year. Cuban Black – I managed to get seed for these from ‘Seeds-by-Size’ before the company went all ‘pear shape’. This is ‘well behaved’ Indeterminate variety that produce good number of fruit but they tend to be slightly different shapes and sizes..all having that ‘black’ colouring. Ester Hess Yellow Cherry – I received seeds for this tomato via the Internet Tomato Trials organiser, 14 years ago. Trial participants received mystery tomato seeds with code names, had to report on how many days after sowing they flowered and the first fruits matured, then on flavour and general impression, and send this information back to the organiser. Only after sending our reports back did we find out what varieties we had been growing. One of my varieties was this very strong growing, indeterminate, cherry tomato. It is prolific, early and tastes good too. Millie Yoder’s Little Grape – Originally sent to me from my seedsaver friend in Colorado, USA, but grows very well here too. This is a mid-season tomato. I have grown this variety both in the greenhouse and outside – better in the greenhouse. Tall, indeterminate, with large sprays of sweet, red, grape-shaped cherry tomatoes. The tomatoes at the end of the sprays are much smaller than those at the top, and as they are seedless too, they resemble grapes. With eyes closed you can be fooled into thinking that you are actually eating grapes. Millie Yoder is an Amish woman and this tomato hails from the Amish religious community. There is almost no internet information about this tomato and it is not in Tatiana’s database. Maybe it is barely known outside the Amish community in the USA. If you like it, please save seeds and distribute further. Old Red Cherry – This indeterminate tomato came from a seed swap with another member of the erstwhile Internet Tomato Trials and it was one of his trial tomatoes. Early, high yielding red cherry tomatoes with a little peak at the base. Deep, rich flavour. Unfortunately I have no further origin information as my swap partner’s hard-drive crashed with all his information from the Tomato Trials. Sibirskiy Skorospelyi (Siberian Early) – This is a determinate/bush Russian tomato variety dating back to the 1950s and produces lovely sweet fruit of variable size which almost fall off the plant. This started outside but we found it needed a few weeks indoors, probably due to a slightly late start. Yabloki Na Snegu (Apples in the Snow) – This is a determinate/bush small to medium fruited tomato variety from the Russian seed company Russkiy Ogorod and comes from its range of “northern” or short season vegetables, so I was interested to see how this compared with our usual favourites grown outside. Our conclusion was that it would probably produce as much as Latah and at the same time, but that the latter definitely had the edge taste wise. Despite its rather “folksy” Russian name, like a number of Russian commercial tomato varieties it is in fact named after a 1980s popular song. However, our observation was that the bunches of unripe fruit did have a look of apples about them. Black Sugar Sweet Turnip – (HSL) interesting dark colour almost like the snake skin maple! I failed the first year as where I live turnips are winter veg and swedes the summer one, so I grew it in the wrong season. Last year it did well as a spring sowing. I believe I did a good job in netting the plants so hopefully they will be true, but as you know I am new to this seed saving stuff and it is the first brassica I have tried to save- so please “rogue out” any oddities.